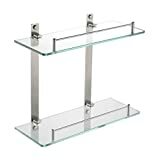 This 2-Tier Glass Shelf Bathroom Lavatory Shelf Shower Shelvingis made from Extra Thick Tempered Glass and SUS304 Stainless Steel, ensuring durability and dependability, which will not rust. Metal bracket, 7MM thick durable glass won't break. Brushed nickel finish, Heavy duty design, Concealed screws. 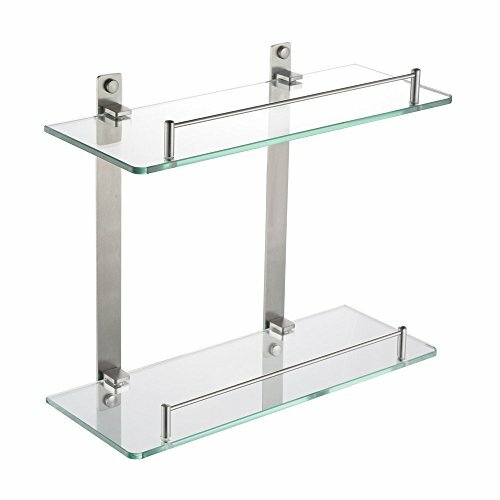 This Glass Shelf with Rail is great to store cosmetics and toiletries on. The rail ensures that things will stay on the shelf and not end up on the floor. Idea for use in Bathrooms,Lavatory,Toilets. Double layer storage design, which saves a lot of space to your home. Hardware pack included. Easy to install, any installation problems, please contact us to resolve.We love our customer -- Care about each detail you would care for--and strive to refine on it!